In this project my goal was to create somewhat of a dynamic still life/vanitas image – motionally dynamic in keeping with the autumnal “fall” while visually dynamic in celebrating seasonal colors and motifs in a semi-traditional yet playful way. Stylistically, this would be one of the few times I completed a project with intentions tending toward the photorealistic end of the spectrum. Pure Blender 2.44 internal render. 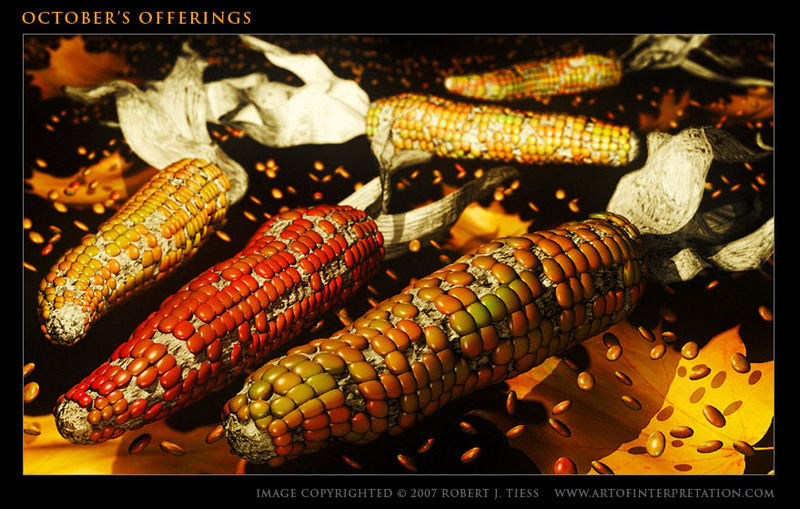 very nice just one eency weency crit is that the corn may be a bit shiny. maybe its jsut me. Good work! Looks sweet RobertT. I think the only thing I think could be changed is a sharper change in color between corn kernels instead of the more gradual blend over a few kernels. Looks sweet though. Good use of colors and DoF. They are looking real. Great shader. Please guide us for such a combination. I like it, It has a nice mood and the shaders are fantastic. It’s nice. All of the corn kernles ar at a 45 degree angle to the direction they are falling. You might hunt around for a script that randomizes angles or seomthing. That and they are all at the same level (it feels like I’m looking at an array of corn kernles. To make this image even more dynamic I would suggest giving it more randomosity and a central point of focus. Where the heck did summer go? Damn! Great work RobertT! I must agree with what has already been said, however. 4* (nearly a 5 though). Is it just me, or are the ears of corn… floating? Great work ,the colours are very nice! Hmm, I don’t know about vanitas, but I guess the withering plants do sort of classify. -I think it’s intended that the stuff is falling, but if it is then I would position it less like it’s sitting on a surface. -The husks are really nice… procedural? -I’d have too look at some corn myself, but maybe a little SSS on the kernels… did you experiment with that? -Hard shadows are OK but if you were to add a surface under the stuff, I’d say soft shadows would look better. -Slight texture (or scupting) stretching is visible on the corn cobs. Should be easily fixed via loop cuts if I’m correct. Pretty nice all in all. i dont like this picture at all… personally i find it very corny! HA HA HA, corny! get it? corny? okay, yeah this is great work but some SSS on the kenals would be nice.